Spring Cleaning Just Ahead Green Road Sign with Dramatic Clouds, Sun Rays and Sky. Wow, with all of this beautiful Eastern North Carolina sunshine, it’s easy to start dreaming of spring. Does this weather get you into the spring cleaning mood? 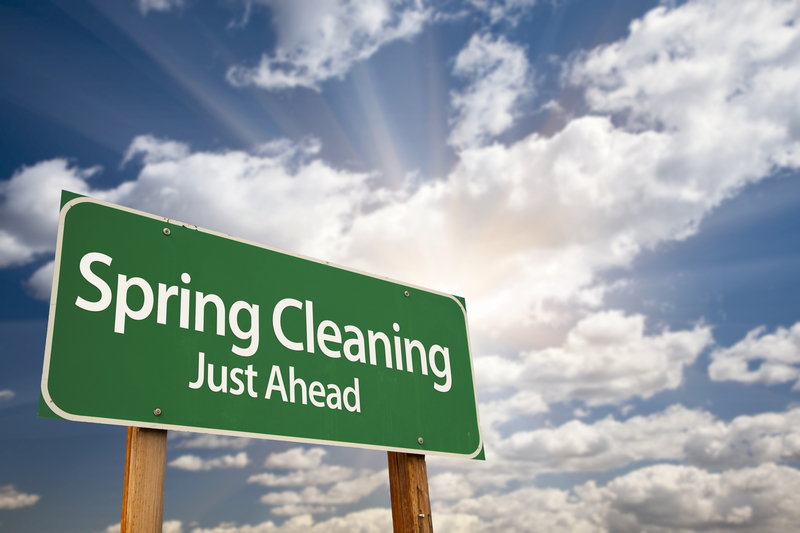 Cleaning the kitchen, going through that mound of winter clothing that has piled up in your closet, or just packing away toys or other items that haven’t been used in a while is a great way to start your spring. Did you know that it’s not too early to start thinking about the maintenance of your cooling system? We already have people calling to set up appointments! If you maintain your equipment well, you will prevent future problems and unexpected costs down the road. Routine yearly check-ups are important and necessary, especially when the warm spring and summer weather kicks in. Your system needs to be working at its peak in order to run efficiently and keep you cool. 1. We will first check the thermostat settings to make sure that the system will keep you comfortable throughout the spring and summer months. If the thermostat works correctly, it will save energy when you’re away and not using the system. 2. We’ll check all of the moving parts and the electrical components/connections. If the system has defective electrical connections, the system may be unsafe or it could ruin the overall lifespan of the larger components that make up the system. We’ll also check that the condensation drains are working correctly. If they aren’t, there could be damage done to the house and humidity levels could also be affected. In the interim, make sure that you are keeping on top of cleaning your air filters regularly. It’s recommended that you clean them once a month or once every other month. If the filters are dirty, the system can’t work efficiently and it could cause damage to the system down the road. Our experienced team of service professionals is happy to take a look at your heating and cooling system to ensure that it is dependable throughout the spring months. Call us today and request service! Or, if you’ve decided that now is the time to invest in a new heating and cooling system, our team of knowledgeable, non-pushy sales professionals are glad to share what system can fit your home and budget!